White mushrooms due to its taste long enjoy the love, even from lovers. Ways of cooking mushrooms a lot - they can be salting, cooking, pickling, drying or frying. Roasting is one of the fastest ways to eat this product, and most recipes fried mushrooms are so simple that they will handle even the young mistress. For cooking fried white mushrooms with onions carefully sort through the mushrooms and rinse them well. Then pour over the mushrooms with boiling water, cut into thin slices, add salt to taste and fry in vegetable oil until tender, about 15 minutes, not forgetting to stir, and for mixing mushrooms is better to use a wooden shovel. Take onion, peel it and cut into rings. Fry prepared in this way the onions with the oil separately from the mushrooms, until it reaches an appetizing Golden color. Mix fried mushrooms with fried onions and enjoy the delicious taste of the cooked dishes! If you want to eat fried white mushrooms in cream sauce, then pour over moved, cleaned and washed mushrooms in boiling water, drain them in a colander and wait until they drain water. Then slice the mushrooms slices, salt and fry them in a pan in vegetable oil until they are almost ready to eat. For a few minutes before frying in a pan, add the flour and mix with the mushrooms. Then pour in the sour cream dish, stir the sauce and boil the mushrooms. If desired, bake the dish in the oven for 5 minutes. 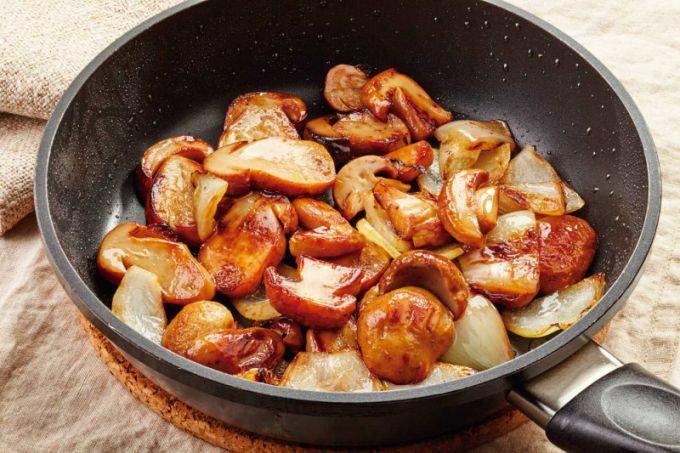 In order to treat your relatives roasted porcini mushrooms with egg, sort and clean the mushrooms, rinse them under water and fry in skillet for 10-15 minutes in vegetable oil, stirring occasionally. For a few minutes until cooked product, mix the egg and milk and gently pour the mixture into the pan with the mushrooms. The obtained salt to taste and cook until done. Place the pan with the mushrooms to the oven and roast there for another 5 minutes. Serve mushrooms with the egg, after watering them with melted butter and sprinkled with the chopped herbs. Fried white mushrooms as a side dish is recommended to serve with fried potatoes.